Waves Hotel & Spa is a beautiful beachfront hotel located on the west side of the Barbados. The hotel was the first all inclusive mind and wellness boutique hotel on the island and definitely sets the standard as far as quality is concerned. Waves Hotel & Spa is situated in prime beachfront position gifting guests with a stunning stretch of white sand and crystal blue waters on their doorstep. This superb hotel is perfectly located in the heart of the tourist centre meaning guests are never too far away from some of the Island’s best restaurants or world famous golf courses. The hotel is famed for its all inclusive qualities as not only are guests able to enjoy the wonderful features at Waves Hotel & Spa but can also utilise the 5 star facilities at other Elegant Hotels on the island. Waves Hotel & Spa is comprised of a number of incredible rooms all of which are luxuriously designed and come in a range of sizes. The most basic rooms on offer are the Standard Doubles which are incredibly well equipped and spacious, containing a whole host modern amenities such as a TV, air con and wifi. Guests are also gifted with fantastic views of the island. Waves Hotel & Spa also has the option of choosing a Spa Room where guests can either have the deluxe pool room which contains all the same amenities as a standard room but also features a balcony allowing guests to soak up the spectacular sunshine from the comfort of their own room. There is also the option to select the Spa Suite which is perfect for couples looking for a quiet and relaxing get away as it located in the adults only section of the hotel. Furthermore, for those looking for a slightly more luxurious room then there are 3 different types of fantastic Ocean View Suites which provide guests with uncompromised views of the crystal blue waters of the Caribbean sea. The Duplex Ocean View Suite is designed with two levels providing guests with a separate bedroom and living space for maximum privacy and space. The hotel is all inclusive and offers an amazing array of features within this such as some of the best cuisine on the island. With 3 different restaurants within at Waves Hotel & Spa everyone's needs are catered for, whether you wish to enjoy some fantastic themed dining in the Seascape restaurant which serves breakfast, lunch and dinner or exquisite Asian cuisine in Shiso. There is also the option to grab a light lunch or coffee in the Kyma restaurant which is ideal before going out and exploring the beautiful island. Another fantastic option included within the hotel is the complementary motorised water sports such as water skiing, banana boating, paddling boarding etc. which keep the whole family entertained. In addition, guests who wish to spend their day pampering themselves in the state of the art spa facility have a wide range of wonderful treatments at their disposal all of which are designed to revitalise your body. The spa also offers yoga and pilates classes in which are perfect for those looking to truly relax in this serene environment. 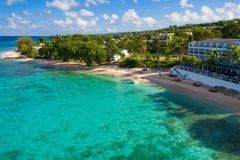 Guests are also able to book wonderful tours through the hotel either of the island for example, to the stunning Bathsheba beach on the east coast or boat trips out to the turtles and stunning coral reefs. The hotel is a fantastic spot for groups of golfers to rest up in between rounds as there are some glorious golf courses right on the doorstep of the hotel. Royal Westmoreland is one of Robert Trent Jones Jnr finest works and is just 15 minutes from the hotel, there is also the stunning Apes Hill which is a mere 19 minutes away and the Green Monkey which is one of the most exclusive clubs in the world and only lies 9 minutes from the hotel. On the whole, for anyone looking for the perfect place to stay on the island, Waves Hotel & Spa provides exquisite cuisine, brilliant bedrooms and plenty more to cater to the whole family or group’s needs.